Share and invite friends to sign the petition on our Facebook page. Get Indigenous groups and religious organizations to join our coalition calling for Pope Francis to revoke the Doctrine of Discovery. Please e-mail us at info@romeroinstitute.org to get the appropriate documents. 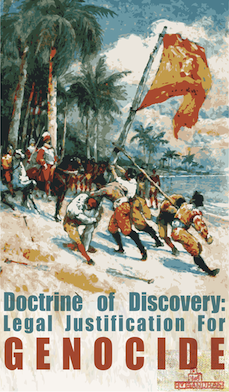 For more info on the Doctrine of Discovery, go to the petition page on the Romero Institute web site, scroll down past the petition to the section called What is The Doctrine of Discovery? Contact the Romero Institute at info@romeroinstitute.org.